RideMax has been mentioned in several national publications, including The Wall Street Journal, Reader's Digest, and Via Magazine (from the AAA automobile club). 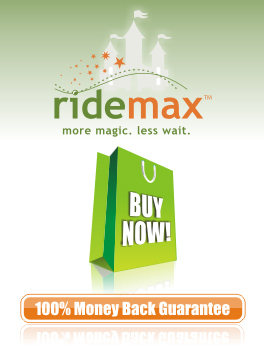 There are numerous RideMax reviews on internet discussion boards, and travel writer Kayte Deioma features this RideMax review on About.com. What do customers think of RideMax? We just came home today - I was armed with a week's worth of Ridemax schedules... and my husband was naturally skeptical. We started last Monday. We were up and ready for rope drop at Epcot and as sure as I am sitting here we followed your plan to the "T." We didn't wait anywhere at any time. Amazing but true. Wednesday we went to Hollywood Studios - this was going to be my true test. All of the hints that you gave [for entering the park] were right on target... we ended up being 2nd in line! We had so much free time because we got everything done so quickly, I will never go back to the "world" unarmed again. RideMax is SUCCESS! Your plan was worth so much more than what we paid. The Disney Cast Member at Toy Story Mania told me that at Christmas time people waited for four hours to ride that ride. We just chuckle now -- thanks to RideMax, there is no such thing as waiting. Thank you from the bottom of my heart! We had a great vacation and saw and did everything we wanted and more. Today was my first day ever visiting Disneyland. I *hate* waiting in line for anything, period, so I figured I would give RideMax a try. Wow! I got to see all 12 rides I wanted to see (the most popular ones), plus a few others, and have all the meal and rest breaks I needed, and in most cases I only had to wait 5-10 minutes for any of the rides. The longest I waited was 20 minutes. In some cases I walked right in and got the best seat! By 3 PM I had seen everything I had wanted to and more, which gave me time to ride the monorail do some shopping and explore Downtown Disney. I realized what a brilliant tool you had created when I saw the crazy long lineups for rides I had already seen earlier in the day. People were in line for 60 minutes or more for rides I just walked straight into! Without RideMax I would have been lucky to have seen half the rides. My 18 year old daughter (and really all of us) REALLY liked knowing where we were going next and what the plan for the day was. We liked knowing when we were doing what. If they wanted to ride something, I'd tell them we would and maybe it wasn't until the next day, but they were all happy knowing that we were going to do what they wanted. We did have a couple of times where a ride was down, but again, because we had an idea of wait times and how things worked, I could come up with a plan B on the spot. It was great. Thanks for having such a wonderful product. It worked even better than expected! Just wanted to let you know I used RideMax for the first time on our trip to WDW in early June 2009, and it was worth every penny! We did all 4 theme parks and 2 water parks in 7 days, going on every ride on our list (sometimes twice) thanks to RideMax. We almost never waited longer than the program stated, and I learned the "secrets" behind using FastPass. I even had fun creating alternate itineraries leading up to our actual trip. I don't think I'll ever take a Disney trip again without using RideMax. Thanks to these customers for these reports! If you use RideMax to plan your visit the park, please let us know how your trip goes. We want to hear from you!